At some point during a period of intense crafty inspiration you get so many great ideas in your head that your brain simply cant keep them all in there and so you have to try and translate them into reality. Its like a law of the universe or something. I mention this only because I seem to be working happily on so many projects at the moment - somethings gotta give - but I 'll take it where I can get it. I was inspired to start hand quilting a quilt. I got 12 inches in before I realised three stitches to an inch is pretty crap and I’ve since managed to convince myself that only an insane woman starts her first hand quilting project with a full sized quilt. 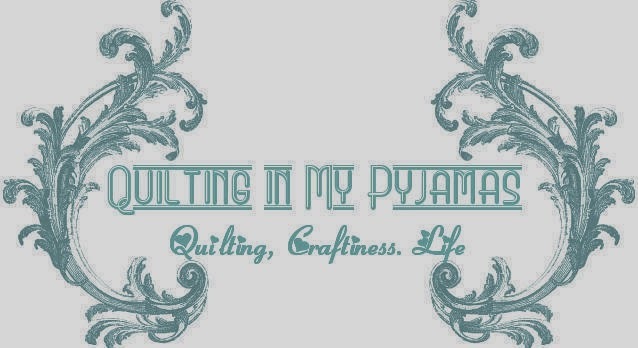 I’m thinking a mini quilt is a good place to start my hand quilting experience. Naturally I'll have to make the mini first so I've moved on to other things. Goodness knows I have plenty of unfinished projects laying round begging to be finished things. I finished quilting the Gelati quilt (thanks for the name Ms. Nerida ) by machine this past weekend. I think I made the right call because I’m really happy with how it’s turning out. This is going to be a lay around, drag on the floor , drop whatever you happen to be munching on at the time quilt for my house so it doesn't have to be fancy. I'm half way through finishing the binding so I'll show you the whole thing in all it's glory soon. Last week I allowed myself to be distracted by Pinterest and all the pretty scarves there. There I was inspired to knit an infinity scarf because I was formerly inspired to make a gingham knitted blanket that I haven’t got right yarn for (and that is seriously going to take forever to make ) and I just wanted to knit something. Then I got distracted by the idea of buying a scarf on Ebay instead. My moral conscience kicked in when I realised that 4 dollar scarf I wanted to buy (with free shipping no less ) was made by someone in China working for 12 cents an hour . Eventually I went back and cast on my stitches for the infinity scarf and have managed to get this far. Assuming my interest doesn’t wane too much I could conceivably be wearing this before the end of winter. Tazz and AusRose made faces like this at a recent sewing day when I mentioned I was going to machine appliqué my hexie flowers onto their backing blocks. I took those looks to mean "Crap-est idea you've ever had " and so I have succumbed to peer pressure and wiser heads than my own and I’m hand appliquéing them onto the blocks. I've done 12 this past week and I'm not finding it as mind numbingly boring as I thought it would be. In fact -it's quite relaxing. "Beep Beep" is finished, washed and crinkled so it looks well loved and is off to Master Jack this week. This kid lives in the tropics so I imagining this will be decorative rather than strictly functional. Onwards and upwards...dont want to lose that mojo! Wow, I love the back of BEEP BEEP. And all the other stuff. As for handquilting I can only say that it takes practice, practice and more practice. One day those stitches will be small enough...you can do it!!! I started my handquilting on pillow cases and place mats. Love Jacks quilt...and dear Kermits face! Very productive. Can't say the same for this neck of the woods especially as I am injured again. Really wanted to sew this weekend but I couldn't move my neck and my left arm isn't working the best at the moment. 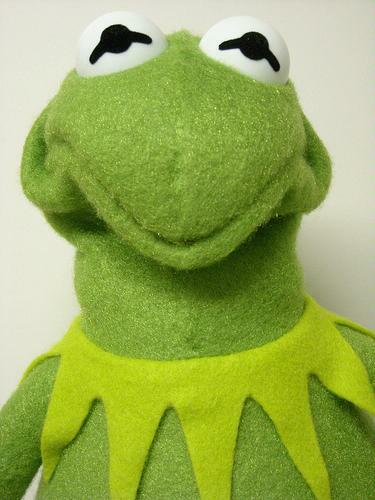 Glad you did the hand applique on the hexes I would have given you the kermit face too. Every kid needs a quilt to lay about on, they don't all have to end up on top. Enjoy those hexies, seriously I would have used the machine. Well done on all your projects. Snap on the Hexie projects. Love the beep beep quilt. I think I crocheted about 35 scarves this past winter. I may never touch a ball of yarn again! I don't have the patience to hand quilt. I end up with wobbly lines because I am too lazy to mark the quilt design. Beep Beep is adorable and I love how you did the back. I thought that piecing backs was the new rage until I recently found out that in Pennsylvania in the late 1800s it was common to piece backs in strips of two different fabrics. I love to hand applique. There is something about the rhythm of it that is very relaxing. I'm glad you got your mojo back. I lost mine for about a week and it was very disconcerting. Love the Gelati quilt and the Beep, Beep quilt is almost too cute to give away! The colors are perfect for a little boy, though. Happy crafting! May your mojo ever be with you! You have been super productive .. you must have used up all the mojo there is because I don't have any. Love the beep beep quilt - Jack is very lucky. Your knitting looks great -- and I love the red. Phew , Youve been busy with so many different projects!! I love your hexagon blocks, such a great idea to have them spaced on blocks. thats a quilt that would look good with handquilting :) . I love your raspberry coloured scarf, you'll be needing it soon, its getting cold!! BEEP BEEP is such an excellent name for that fun quilt!!! Love Jacks quilt, bright and colourful with cars, how perfect for a boy! Glad you decided to hand applique the hexies on and that you found it relaxing, rather then torture! Just think when we are old, grey, nearly blind, have arthritis in our hands and shop for Depends we will be grateful that we were able to hand sew in our "youth" and will have show and tell to prove it!!! Yep OK we might get hit by a bus, it does sound more appealing! Nice work on the finishes and works in progress...lovely distraction to have you visit with me on the weekend....and we missed a wedding!!! if only we had known!! Hexies look great! Maybe the sour faced ladies were right? Love Jack's quilt. I think you need to hand it to him in person... especially since cold weather is coming. Hahaha, that is an exact rendition of my face, I'm sure of it! With all the time you saved by not hand quilting, the hexie applique will be a breeze. I'm really out of the loop 'cos I've never seen BeepBeep before but I love it. I think you'll be glad you changed your mind with the Henie quilt, it is going to be really awesome and hand quilting a whole big quilt is not for the faint hearted or the inexperienced ... As you worked out. Seems simple but doesn't work that way until you've had a bit of practice. You are amazing! So glad you ditched that list idea ;) Everything is lovely and I love the Kermit photo. I can just see those two with that look on their faces. Your hexies are just looking completely gorgeous so I'm glad you did them the honour of hand stitching them. (I find that whole process relaxing too.) Hope your next week is just as lovely! Beep Beep looks great. Wow you've been really busy. The hexies look great. Hope you've been able to keep up the mojo. I'm trying to get mine back.